As I come to you today if I say the word “call” to you, what do you think of? Phone calls? Obviously. Calls from telemarketers? Ick, right? Calling the kids to dinner? Calling the pets into the house for the night? In the Gospel for today, we see where Jesus calls Peter to be one of the twelve apostles. Now there are a lot of different ways we can go with this sermon, but I am going to put it to you today that Jesus Called Peter for Us, for You. That’s what we are going to talk about today. At this point in your lives, I am assuming you know a lot of things about Jesus. You know He was: born in Bethlehem, never sinned, taught a lot of stuff, did miracles, died for you on a cross, rose again on Easter Sunday. You know that stuff, right? Something else you need to know about Jesus is that He didn’t want all that stuff we know to be a secret. He knows that what He did and what He said are the things that will save us, and He did all those things to save us. He wants us to be saved, so we need to know these things He did and said. Jesus not only went to the cross for our salvation and rose again, but He also called apostles, and these days He calls pastors so that the Good News of the cross and empty tomb would be shared and known everywhere. In a passage in the Large Catechism, Martin Luther says, “The work of redemption is done and accomplished [John 19:30]. Christ has acquired and gained the treasure for us by His suffering, death, resurrection, and so on [Colossians 2:3]. But if the work remained concealed so that no one knew about it, then it would be useless and lost. So that this treasure might not stay buried but be received and enjoyed, God has caused the Word to go forth and be proclaimed. In the Word, He has the Holy Spirit bring this treasure home and make it our own” (LC II 38). Jesus wants to get His Word to us. As we note how Jesus called Peter, we are reminded that Jesus sees to it that we hear the preaching of the Gospel, that we know about His death and resurrection, and that we have life in believing this. But first, before Jesus makes Peter a pastor, He’s got some unfinished business. Let’s picture this, then, that morning on the Sea of Galilee. Peter, James, John, and their crew had fished all night. They had worked extra hours trying to find a few fish, but they were skunked. Got nothing. Now there is only cleaning up and heading home for some rest so they can get after it again that night. But then they see Jesus coming along with a crowd. 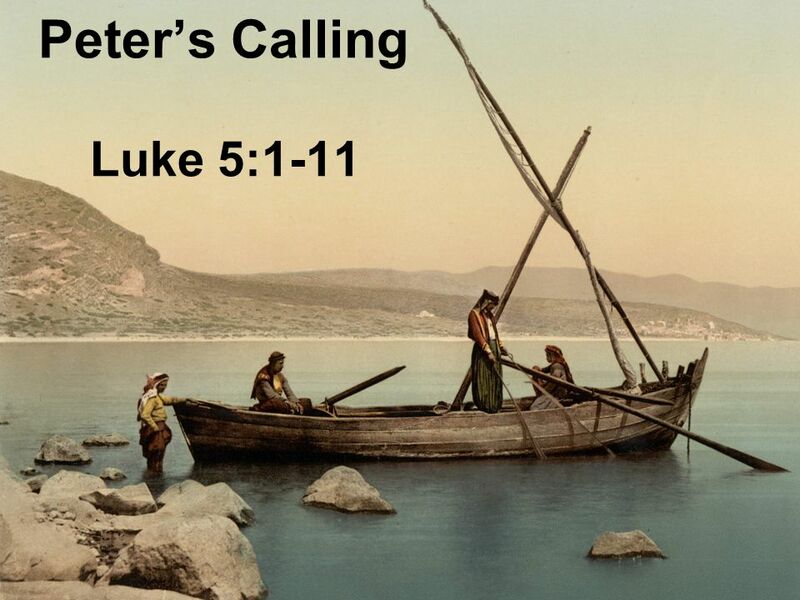 Jesus asks Peter if He can preach to the crowd from his boat. And Jesus does this, with Peter and the gang listening in while they wash the nets. When Jesus is done teaching, He tells Peter and the crew to go back out and drop the nets in deep water. Now Peter could have protested. “Dude, we got nothing all night. Nothing in the nets. You can’t catch fish in the daytime. You can’t catch fish in the deep. You preach. I’ll fish.” But Peter doesn’t. He does what Jesus says. With Jesus apparently still in the boat, they go back out and drop the nets deep. And the One who spoke on the fifth day and created the fish in the sea puts the fish in the nets. The catch is big enough to break the net and practically sink two boats. And look at what happens. Peter, in this catch of fish, sees what Jesus is up to, that He is making a claim on Peter. This great catch of fish is not to make Peter a great fisherman but to end his fishing career. Jesus is saying to Peter, “Now you are mine,” and Peter is afraid. In the middle of a huge pile of flopping fish, and in the middle of a sinking boat, Peter falls down on his knees at Jesus’ feet and begs Him, “Depart from me, for I am a sinful man, O Lord” (v 8). You’d think he might have other things on his mind, but Peter is not terrified of sinking; he is not afraid of dying. He is afraid of Jesus, afraid of His holiness and wrath, and afraid of this claim that Jesus is making on Him. And Peter is right to be afraid. I read a pastor who wrote that our fears tell us about our idols. “What are you afraid of?” Are you afraid to die, to hurt, to lose, to be lost? Are you afraid of the past, of the future, of what might happen, or that people would find out what did happen? Are you afraid of your parents, your children, your boss, your neighbor? Are you afraid of pain, afraid of yourself, afraid of the devil? There are a lot of things that we fear, a lot of things that we are afraid of. The First Commandment teaches us to “fear, love, and trust in God above all things.” Peter has it right that day, knee deep in fish in a sinking boat: he is afraid of Jesus, and he is afraid because of his sin. “Depart from me, Lord. I’m a sinner.” The last thing that sinners want is Jesus to be hanging around because His coming should terrify us. No matter what trouble we’re in, this is our most profound and pressing concern: Jesus should judge us because of our sins. But He doesn’t. Instead of condemning you because of your sin, Jesus takes your sin, holds your sin, carries your sin to the cross. And there, instead of condemning you, He is cursed, afflicted, stricken, forsaken in your place. Jesus suffered for us, died for us, for you. My brothers and sisters in Christ, Jesus is not content to be silent. He wants to be preached to you. He wants His promises to be heard by you. He wants to be believed in by you. He wants His name and kindness to echo in your ears and in your hearts because He loves you. We rejoice in the calling of St. Peter because we see in this calling how Jesus still loves us. He not only died for you, and rose for you, but He calls Peter and His apostles and His pastors so that you would know it, believe it, rejoice in it, and have eternal life in His name. Nothing secret here. Jesus did everything to make sure we would hear this, know it, and be blessed.